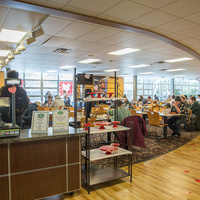 The WildCat Den is located on campus on the second floor of the University Center. Whether you are looking for a burger hot off the grill or an entrí©e cooked right in front of you at the Action Station, we have something for everyone. I wasn't quite sure what to expect going into this dinner experience, but I ended up having a great time! Atmosphere, dinner, and drinks were all delicious! The mocktails were a fun treat that us underage students could really get into and enjoy!